Startup incubator Y Combinator’s Sam Altman created a course called “How to Start a Startup” at Stanford University this fall. The 20-session class has a star-studded lineup of guest speakers, including Peter Thiel, Marc Andreessen, and Ron Conway. This week’s lecture was done by Box CEO Aaron Levie. During the 46-minute class, Levie touched upon a number of subjects, from how he started Box to the best business books he’s ever read. 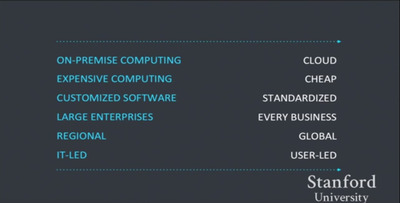 At one point during the lecture, Levie also spoke about how the tech landscape has changed in the past five years to make it a “magical” time to build an enterprise software company. 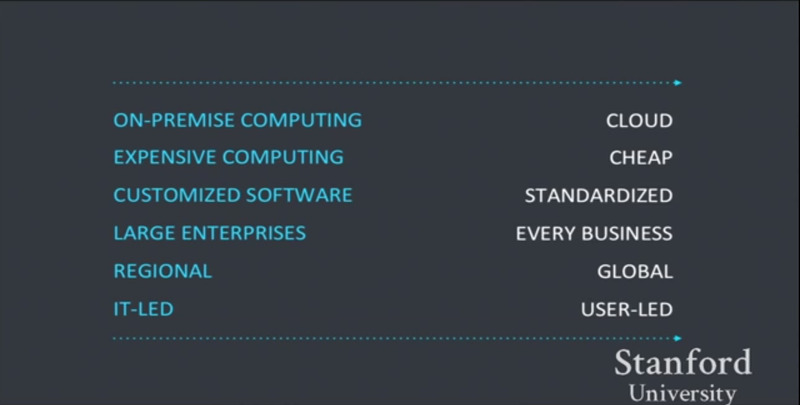 Levie basically says the biggest disruption has come from the move to the “cloud.” In the past, enterprise software had to be built in every single customer’s individual datacenter (“on-premise”), and it just wasted lot of time and money for everyone involved. But now with cloud servers, like Amazon Web Services or Microsoft Azure, businesses can use servers remotely, on-demand, simplifying the entire process. Because of this, the whole cost of starting an enterprise software business has dropped. There’s no need to build customised software anymore, either. And since it’s become easier and cheaper to install enterprise software, customers from all over the world can afford to use it, as opposed to the past when only the biggest companies had the budget to buy it.